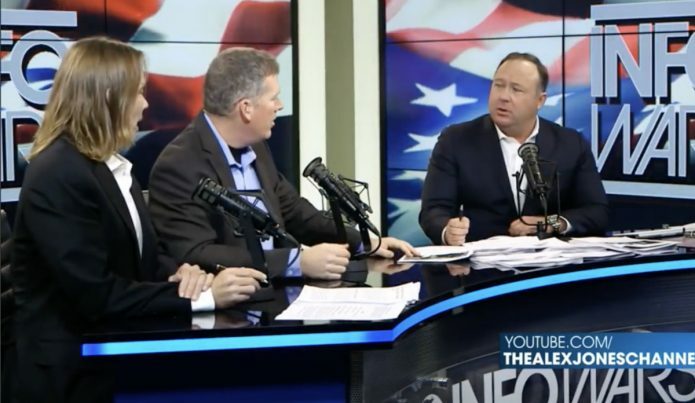 Natural News founder/editor Mike Adams, the Health Ranger, made a recent appearance on the Alex Jones Show after a two-year hiatus to discuss bombshell information about vaccine ingredients and other health-related concerns. Adams, who had spent a three-year hiatus from the Infowars.com founder’s daily program to build and certify CWC Labs, where he is science director, noted that he believes there is a nexus between the chemical poisons in a lot of our foods and medicines and Americans’ tendency to be taken in by fake, malicious news from “mainstream” legacy outlets like CNN, the Washington Post, and The New York Times — despite the fact that they are routinely wrong. Adams said a big contributor to the poisoning of our society is biosludge — which he describes in a feature documentary on the subject as “the greatest environment crime you’ve never known.” Essentially it is a combination of waste byproducts from humans, animals, and industrialization that has been turned into fertilizer — meaning all of those toxins are finding their way right back into our food chain. Adams, who appeared on the program with Dr. Edward Group, D.C., ND, then moved on to discuss the toxicity in vaccines — an especially relevant topic given that this year’s flu season has turned out to be one of the worst in recent memory. Despite the fact that large numbers of Americans got flu shots. One of the major changes that the federal government’s medical and scientific agencies made roughly seven years ago, when the real push for annual flu shots began, was removing warning labels from flu vaccine strains that warned against giving them to pregnant women. Adams and Jones noted that a Centers for Disease Control and Prevention study even found that after the warning was lifted, more pregnant women had miscarriages. “It was a CDC study,” Adams said, as show producers put up the image of the University of Minnesota’s Center for Infectious Disease Research and Policy website featuring a story about the study. “A study published today in Vaccine suggests a strong association between receiving repeated doses of the seasonal flu vaccine and miscarriage,” a news story on the subject, dated Sept. 17, said. Adams noted further that his CWC Labs, using its Mass Spec Time of Flight instrument, is running tests on the most widely used vaccines and, in the coming weeks, will be publishing bombshell information about what they really contain. “We are going to open-source publish the molecular formulas we find in common vaccines, and it is going to break the wall of pseudoscience of the vaccine industry,” he said. To watch the complete episode of The Alex Jones Show with Adams and Group, click below.